For normal undistorted vision, the cornea should be smooth and equally curved in all directions. When astigmatism is present, the cornea is warped and curves more in one direction than the other. In other words, the cornea is shaped more like the side of a rugby ball than a football where, in one direction, the surface is steeper (more curved) than the other. 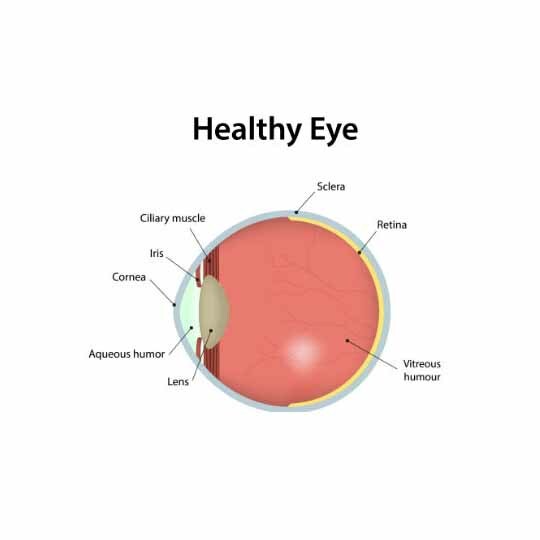 Normally, light enters the eye and is focused precisely on the retina. With astigmatism, the warped cornea causes the light rays to bend improperly depending on where they strike the cornea. They are not refracted (bent) equally in all directions and so one focal point on the retina is not attained. Some light rays are not focused on the retina but are focused in front of or behind the retina. The result of multiple focal points is distorted vision. Objects appear somewhat indistinct and slanted. Vision with astigmatism can be compared to what one sees when looking through a glass bottle, with images appearing too tall, too thin, too wide, or blurred. 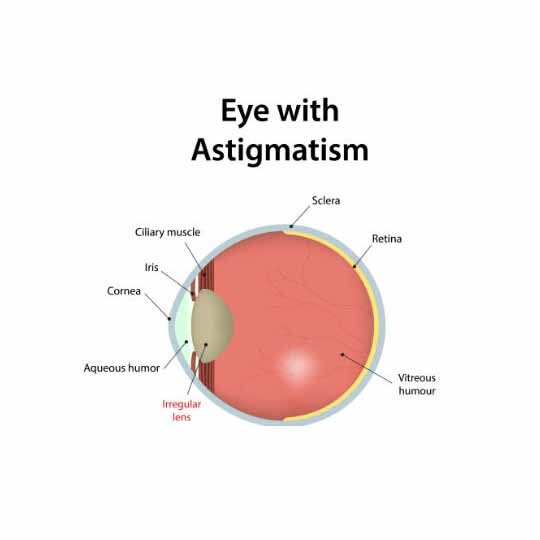 Astigmatism is most often caused by a defect in the curvature of the cornea but may also occur from an unequal bending of light by the lens inside the eye. Astigmatism can occur in conjunction with short-sightedness (myopia) or long-sightedness (hyperopia) and usually remains unchanged through life despite natural changes in the amount of myopia or hyperopia. Astigmatism can also result from corneal scars or surgery. Eye surgery may cause the cornea to scar and warp, changing the path of light as it enters the eye. Some patients experience surgically induced astigmatism after eye surgery. Tightly tied sutures can cause a slight wrinkling of the cornea. The patient will experience distorted vision or astigmatism until healing or loosening of the sutures relieves the problem. A small amount of astigmatism is common and usually does not need correction. However, in cases where the problem is more severe, glasses and contact lenses are used to correct vision. To correct astigmatism, glasses or contact lenses are ground to neutralise the defective curvature of the cornea. Hard or gas permeable contact lenses generally improve astigmatism better than soft contact lenses. But in many cases soft contact lenses can be helpful. As contact lens specialists, Major Opticians are experts in dealing with astigmatism using the full range of options. We specialise in helping patients who have been told they "can't wear contact lenses". For a complete examination and professional advice regarding your vision correction needs, contact us to make an appointment.